Multi-hand Blackjack is an even better version of Blackjack, if you love Blackjack which most people do, then you will be bowled over by Multi-hand Blackjack. Multi-hand Blackjack is played in much the same way as regular Blackjack but the only difference is that you are playing with 5 possible hands instead of one hand against the dealer and using 5 52 card packs. Multi-hand Blackjack can be found at many online casinos and is a thrilling and enjoyable game to play. Blackjack is one of the only games played on the internet and at land based casinos where your decisions directly affect the outcome of the game. 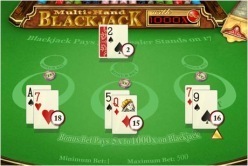 Multi Hand Blackjack has the same rules as Blackjack and is played in the same manner. The game begins with placing your bet by choosing the coin size that you want. Depending which casino you choose to play at, the betting options will differ but most casinos allow for every level of player with every budget and of course you can also play multi-hand Blackjack for practice or fun before you place your real money bets. Once you have decided on your coin size and placed your bets, whether on one hand or all hands, you can begin the game. The game commences with each of your hand being dealt 2 cards face up, the dealer also receives 2 cards, one face down and one face up. At this stage if the dealer has an Ace card it is best to take out insurance which is an option and insures your bets against the dealing landing a blackjack which is made up of an Ace and a face card and equals the 21 number that you are aiming for. If there is no Ace but you have hands with the two cards of the same value, you have the opportunity to choose to split these hands. The split involves an extra hand and an extra bet being placed but it does give you more chances to win. With your hands in place you can now go through each hand methodically to decide what the best course of action is. The aim of the game is to get as close to the value of 21 with your cards as possible, this involves making a decision of whether to hold each hand or add to some of them in the hope that they will get close to the value of 21. If your hand goes over the 21 value then it is considered a bust and you lose the bet for that hand. Once you have decided on the course of action for all of your hands, the dealer then reveals his second card and the action begins. A dealers hand must stand at 17 which means if he has a hand of value 17 no more cards are drawn and the results of the game can be determined. Otherwise, cards are dealt until he reaches 17 or is bust. One of the great things about playing Multi-hand Blackjack is of course that the game is not over with one hand, you have 5 hands to play with and choose different options which of course give you different chances to win. When playing multi-hand Blackjack you can also find the game at flash casinos which means that you do not have to download the casino to your computer, you can play directly from the web browser. Multi Hand Blackjack is a great casino table game that works really well online and gives you hours of enjoyment and of course winnings. Download and Play Multi-Hand Blackjack Now!